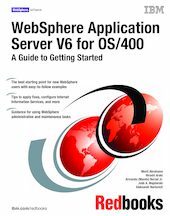 This IBM Redbooks publication helps you get started with IBM WebSphere Application Server V6 for the IBM eServer iSeries. Designed for new WebSphere users, this book presents the WebSphere architecture, administration, and maintenance topics in an easy-to-follow format. It answers many of the common questions that new users tend to have about starting to use WebSphere Application Server. While this book is written for new WebSphere users, some of the topics will be of interest to experienced users. Such topics include configuration of the Internet Information Services server and the WebSphere Application Server.